After struggling the spacing on the fringe (fringes? ), I finally finished Juli's poncho and it was Tennessee-bound. But wait, what's this? Two ponchos? Oh yes, that's right. 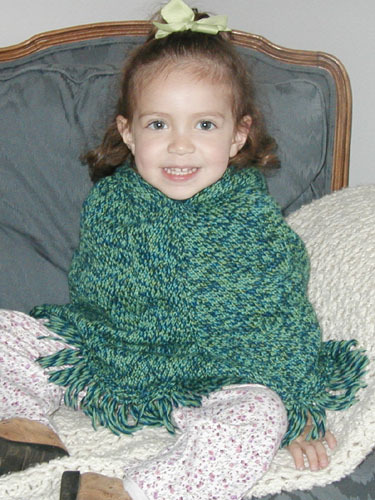 I "forgot" to write about the poncho that I was making for T., Juli's mom. 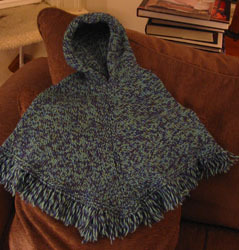 It's essentially carbon-copy of my Francisca poncho, only in blue instead of terra cotta. And since T. is an occasional reader of gringa.org, it's progress could obviously not be documented here. Did I mention that Juli's going to be our flower girl? When I told my mom, she wondered aloud whether Juli, because of her young age (she'll be three), might be a bit intimidated by walking down the aisle with everybody looking at her. I have no such worries, I told her, this child was born for the stage. Behold, Juli strikes a pose for her adoring public. My daughter Shannon was in my sister's wedding when she was not quite three. She actually did much better than one of the other little girls in the wedding who was a tad bit older. btw, juli looks very cozy in her poncho!